Are you having trouble getting your kids (or yourself) to eat your veggies? Like Popeye, I eats my spinach! 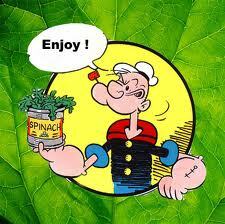 Well, actually, I drink my spinach. As the old saying goes, “out of sight, out of mind”. I disguise my veggies in my smoothies. My kids don’t mind eating veggies and when I blend them, it makes it easier to get it in them without the fuss. I have a few favorite Pulverise and Disguise smoothie recipes I’d like to share with you. Let’s go check them out here. I would love to know which were your favorites. Share below and you if you have a favorite, share that too. Changing America, one stomach at a time!! Next Post Do you have JUNK in your TRUNK?